Feeling at odds with yourself and your body leads to high stress and low energy. It leads to managing your body as a project, or your injury or health challenge as a life sentence. NO ONE wants to play victim in that kind of story! The true story of your body is physical, it is personal and it is connected to the experience of your unique human spirit. Your true story is powerful. It is Your Inner Athlete. In June, I introduced the concept of The Inner Athlete in my article Busting Through the Exercise Blues. Today I want to dig deeper and talk about how to tap into The Inner Athlete, and why uncovering and getting in sync with Your Inner Athlete can be one of the most powerful things you do in your journey towards health and wellness. Everyone has an Inner Athlete. I don’t care whether you are a ultra-marathoner, a yogi, or a casual walker. You can think about Your Inner Athlete like an internal compass responsible for driving behavior when it comes to health, wellness and fitness. When in sync with Your Inner Athlete, you are at peace with yourself and your journey. You can assess popular beliefs surrounding health and wellness, identify truths and sift out the elements that align with your own personal goals. You are empowered and feel a sense of freedom because you experience success and know you are on the right path. The Inner Athlete Advantage is the freedom to play and eat like a kid, with the wisdom of an informed adult. It is he freedom to never, ever “diet” or “exercise” again. The Inner Athlete eats and trains to be ready for all of life’s adventures. That sounds great, right? So why is it so easy to feel at odds with yourself when it comes to health, wellness and fitness? Well, there is an enormous amount of confusion about ideals stemming from the health and wellness industry. You are either “right” or “wrong” when adapting a strategy or approach to your fitness. Judgment is rampant and most people seem to have an agenda and are trying to control your belief set. A powerful “Cultural Compass” has emerged in the industry, and unfortunately, no matter how hard you try, it is nearly impossible to experience success while following its direction. Some people will make you believe a certain kind of exercise is the best kind, or that a particular approach is bad. Others will say you need to dedicate a certain number of hours to your fitness routine daily or else you’re wasting your time. Still others will swear eating a certain way is the only way to lose weight, or that certain supplements or vitamins are your golden ticket to experiencing overall wellness. The list goes on and on. 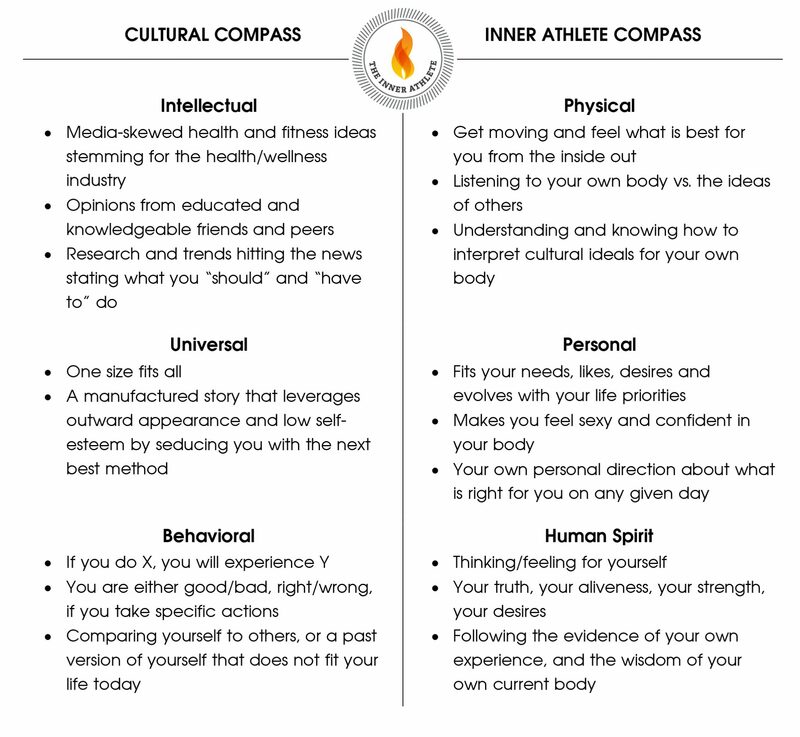 The first step to tapping into Your Inner Athlete, is to accurately recognize the Cultural Compass and how it dictates your thinking. Knowledge is power and once you identify how this bogus compass has a strong hold on your thinking, you take your first step towards freedom. You are your own unique person—spiritually, emotionally and physically—and what works for you will be different from what works for anyone else. You have your own likes, dislikes, history, challenges and goals. All of these things need to be considered when setting your course towards your overall health and wellness. The Cultural Compass does not take into consideration any of your unique circumstances, rather it tries to ramrod you into the same box as everyone else. This only has the potential to leave you feeling unsuccessful, angry and frustrated. Connecting with your Inner Athlete allows you to look internally and customize a program that speaks directly to the experience of your unique human spirit. You can clearly delineate where you are, where you want to go and the steps to get you there. If you trust Your Inner Athlete and give yourself permission to stay your course, despite everything else, you are sure to find energy, strength and aliveness in your journey to health and wellness. And in my book, that equals success. What is most important to me right now? How does my eating + exercise fit into this? From here—no matter what your circumstance is—you can get clear about the steps to take at the present moment to move you forward. Your Inner Athlete is always here. Now. Within. Waiting to help you have a day full of whatever movement and nutrition is best for you at the present time. Seriously… just ask it! It’s waiting to let you know what the two of you can do together. Ashley DePaulis, is the owner of ASH Fitness and Founder of The Inner Athlete. She helps everyday athletes master their minds after an injury or health challenge so they can get back into action. She offers one-on-one accountability and training, and transformation through her group program – The Inner Athlete Advantage. To learn your unique pathway to sustainable health and motivation, along with the mental and physical tool set needed to navigate life’s adversities connect with Ashley and The Inner Athlete community on Facebook or visit The Inner Athlete online to learn more.